The predecessor to the newly released Insurgent, Divergent, is film I watched with largely passive consideration. That film centred around the principle of factions that divides society into five groups based on personality – think the Sorting hat in the Harry Potter series. It is ostensibly an interesting idea and it plays on the conflict of personality young people go through and the idea of an overbearing society imposing roles on them. That film was handled with credit and serves us a setup for the larger setting of this YA series and in many ways Insurgent would make its predecessor either better or worse. Unfortunately we end up with the latter. Insurgent is generally bigger and more intense with the action and effects to match but it ultimately just falls flat as a limp experience. 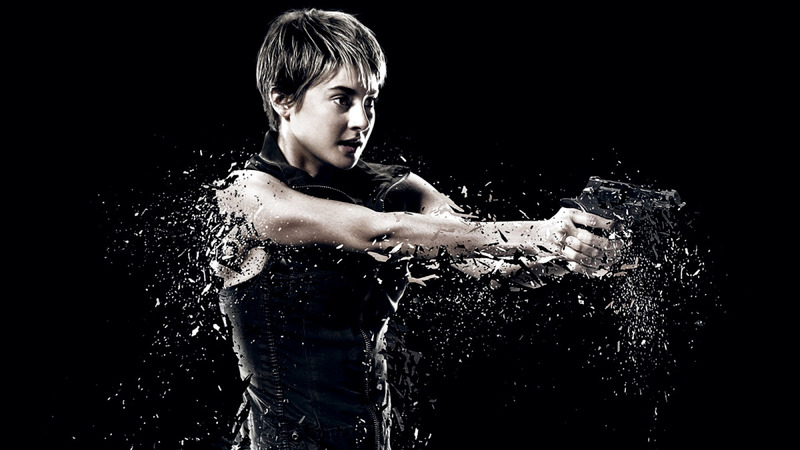 The film opens in the aftermath of a war against Abnegation, Tris’s (Shailene Woody) home faction. She is on the run from odious Erudite leader Jeanine (Kate Winslet) who is after her because of her status as a Divergent societal misfit. Jeanine has come into possession of a mystery hexagonal cylindrical artefact with blinking blue inscriptions on the side that only a Divergent of superior abilities can unlock through completing a series of gruelling physical, mental and emotional simulations – no prizes for guessing who that chosen Divergent is. Jeanine believes the unlocking of this codex will reveal something monumental pertaining to their society and this I believe is meant to be the films pay off and the set up to the finale, Allegiant, which will be stretched out into two films like The Hunger Games: Mocking Jay book. The question with such developments for films like The Hobbit, Mocking Jay and this Divergent series is if there will be enough content to work with. Mocking Jay seems so far to have worked around the thinning out with elaborating a central idea flanked by great direction and lead performances and the Hobbit also succeeds to a lesser extent by overindulging in spectacle and action but I do doubts Allegiant because even Insurgent which has a single book to contend with struggles to give audiences enough to keep us engaged. The film ends and we can point to the very short thread that involves the mystery codex in our antagonist’s hands but it is really just surrounded by tons of chaff as the film just needs two steps to get that point but takes one and marks time in one spot serving us bouts of fire fights and fight scenes before taking its final step towards its denouement. The film infuses sequences that may excite some with epic jumps across speeding trains and it is generally more intense and visceral than some actions films around that pander to the PG-13 audience but that just isn’t enough to paper over the weak plot. Tris is on the run with her boyfriend and fellow Divergent Four (Theo James), her inherently nervous and unsure brother, Caleb (Ansel Elgort) and the real shady Peter (Miles Teller). The series also throws in some new characters as they make their way in this dystopia with Octavia Spencer as the head of the hippie pacifists in the Amity faction were Tris and her posse of fugitives seek brief asylum and before long they are on the move till they find themselves in the camp of the Factionless rebels and their leader played by Naomi Watts and for some weird reason, it took me forever to distinguish the Australian actress. Most of the characters we run into are just single note pit stops with little substance as the director really has no interest in anyone save for Woodley as Tris who comes off as very tortured and vulnerable because of the cross of her parents’ death which manifests in the codex simulation in the finale whilst also being quite defiant and as feisty as they come in a very physical and passably nuanced coming of age performance. The creative team here led by Rob Schwentke looks to have dropped the ball and forgoes the potential of really finding substance in the numerous characters and relationships we care nothing for inhabiting this perceived dystopian gloom. Instead it opts for repetitive action that chases its tail till it gets tired and settles for a finale that is less of a payoff and more as an usher into next year’s sequel.